The VIX Index (Chicago Board of Options Exchange Volatility Index) is a financial instrument designed to show the stock market’s expectation of implied volatility. Also known as The Fear Index (or Fear and Greed), this instrument flashes across the screens of most trading terminals and financial networks all day. A more accurate description of what the VIX measures is the Implied Volatility that is being priced into S&P 500 Index Options over the next 30 days. 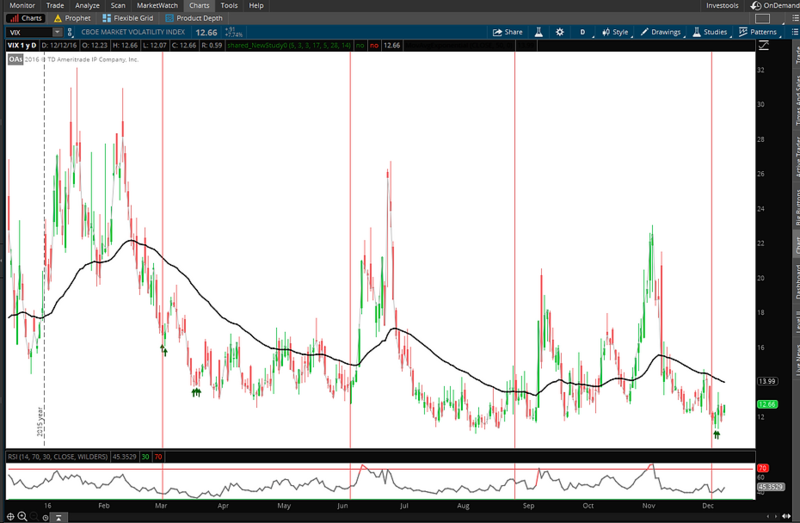 Using a wide variety of S&P 500 Index Options, the VIX offers some indication of the 30 day IV (Implied Volatility) as is being priced by the options market. While the original VIX was based on the OEX (S&P 100) options using only 8 different contracts, the current formula changed in 2003. The midpoint of the bid-ask spread of S&P 500 Index Options that trade to the next two standard expirations (no weeklies) with at least 8 days left until expiration. When a series reaches the 8 day point, it is no longer used in the calculation, rather the options that expire further in the future begin to contribute to the VIX calculation. The contracts from these two expiration series are the at and out of the money puts and calls, extending out of the money until there are two consecutive strikes that have no bid-ask market posted. Using all of these options, a synthetic at the money (ATM) option is created that expires exactly 30 days from the moment of calculation. (I’ll spare you the math here) This results in a synthetic IV of that option and voila… We have our VIX. It’s too small to read but that’s a VIX that printed almost 90. 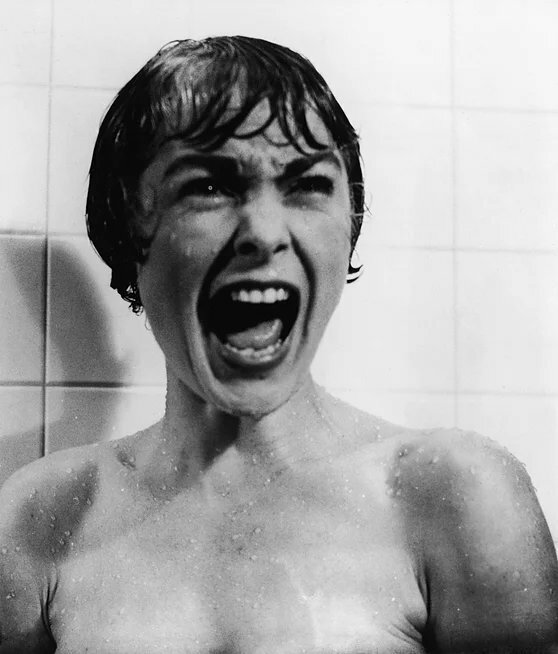 Extreme fear. So why the inverse correlation? When markets rally, traders aren’t in any hurry to go out and buy call options. But, when the S&P comes under pressure and drops, this nearly always creates a panic demand for put options to try and hedge their portfolios. Meaning, when there is nervousness or fear about the overall market, the concern results in high demand for put options boosting the level of the VIX. When it comes to security pricing you will see mention of two main types of volatility: Historical and Implied. Historical vol is factual but doesn’t give any insight about the future movement of a stock, the forward looking (Implied Vol) is used for that. Orderflow dictates the direction of IV. Put/Call Parilty is a concept detailing how put and call prices are linked to each other via the price of the underlying stock. Using Apple $AAPL as an example we can demonstrate how this works. If I combine a stock position in AAPL with a Put Position this can result in nearly the same payout as a call option in AAPL with the same strike price as the put. If this relationship gets out of balance (out of parity), an opportunity exists known as arbitrage. Trading firms will recognize this quickly and will act to take advantage of the mispricing pushing the put and call prices back in line with each other. In plain words, increased demand for call options will raise the price of that call. As the price of the call moves higher, the corresponding puts should move higher as well. If not, an “Arb Trade” will exist and eventually the options prices will move back in line. A couple of easy calculations are below that you can use to impress your friends. Even though if you have made it this far in the article, it’s safe to say you probably have none. Today the VIX is trading near 12. If you take the VIX and Divide by the Square Root of 12 (3.46) you will get the expected 30 day market movement. 12/3.46 = 3.47%. The market is expecting a 30 day movement of 3.47%. As a rule of thumb you can take the VIX level and divide by 16 to get a rough estimate of the daily move expected in the stock market. Once again, today the VIX is about 12. Divide that by 16 and you have an expected daily move of 0.8%. 3. In options trading I use a VIX Level of 20 to dictate how I trade. What does a VIX of 20 really mean? A VIX quoted as 20 in interpreted as SPX Options pricing in an annualized move, up or down, of 20% in the S&P 500 Index over the next 30 days. If you want to trade the VIX, you have some options. You can buy VIX Futures that trade on the CBOE Futures Exchange. 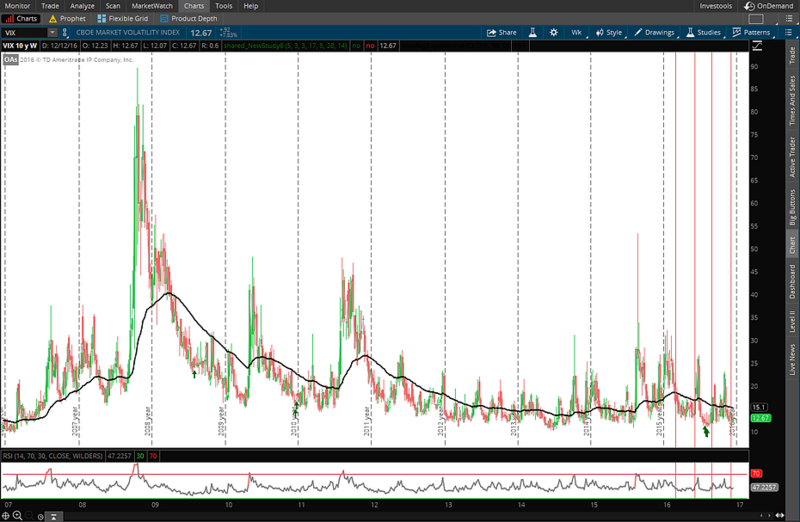 Or, you can pick up the ETFs or ETNs of the VIX like $VXX, $VXZ, $VIIX, etc. If you go with an ETF/ETN just make sure you understand what you are buying. Some of them are leveraged, some inverse, tracking error, etc. There are also VIX instruments for other exchanges like the NASDAQ, International Stocks, and many others. The VIX is a versatile tool we should make use of, perhaps at times like these when it’s cheap to buy as protection. On TV you may hear the pundits say “Buy protection when you can not when you have to.” That can be good advice or bad advice, depending upon the situation but that is a topic for a different article. As to what to expect in the near term, once again take a look at the chart below and let me know what you think. Are we in the clear or are we in for a VIX spike & market correction some time soon? What say you?